As Food for the Poor (FFTP) Guyana enters into its 25th year, the organisation is urging Guyanese to support its work so that its efforts to minister to the poor can be extended into the remote hinterland. Speaking with Stabroek News recently, Chief Executive Officer (CEO) Kent Vincent said there are many who believe that since FFTP-Guyana is supported by FFTP Inc in Florida, the organisation does not need support. “That is not true. Without local donations our operations will cease,” Vincent said. He disclosed that on average, FFTP is able to raise $15 million a year but it can do with another $10 million. “We would love to reach more areas. We wish to thank all those local sponsors who have worked with us throughout the years. 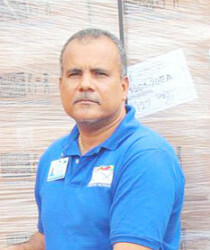 Corporate Guyana has been helpful but we still need assistance from both corporate Guyana and the general public. We reach most areas but the hard ones to reach are Regions 1,7,8,9. We actually reach Region 9 but those are big areas so what we send in a truck might not be enough and though we work through individuals to identify persons in need, it is not enough,” he emphasised. Vincent explained that while all the items donated to persons by the organisation are sourced from FFTP Inc in Florida, most administrative costs are met through local fundraising and donations. He said while Florida helps with administrative costs, their contribution goes mostly towards salaries. “We do fundraising to pay our utilities and assist in transporting donations,” Vincent said. The organisation, which has 53 staff members in 10 departments, has expanded beyond receiving and giving donations and now has a projects department which deals with creating homes and agricultural opportunities for the less fortunate. He asserted that FFTP has helped just about every other charitable organisation and operates across the country through individuals and communities in Berbice, Essequibo and other outlying areas. “There are people through whom we channel our donations. They identify the poor persons in their community and we go and check to verify the need. Once we have things, we give. There are some organisations we are committed to every month and some of those groups take up donations to pay for transportation costs. Every little that we get helps fund our operation here,” he stressed. Vincent added that though administrative expenses are funded by FFTP Florida, employees are not paid with US dollars as some believe. “The salaries here are basically how the average person is paid, we are paid very similar to the public servants pay,” he said.